Baby Costume Hats: 10 Hats So Cute, You'll Want Your Own! Baby Costume Hats: 10 Hats So Cute, You’ll Want Your Own! Baby costume hats! Whether it’s Baby’s 1st Halloween or a fun photo session for which you need props, baby costume hats are super fun to have on hand and are sure bets to get a smile out of anyone! 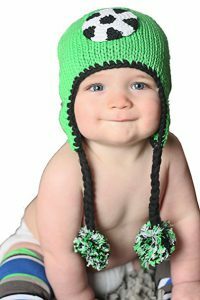 This post is all about making your adorable baby even cuter with some hats that are so amazing you’ll wish they came in adult size! When can you use baby costume hats? What might you need them for? A few ideas are 1) anytime you want to draw attention to just how adorable your little one truly is (and he or she IS the cutest thing ever, right?) A cute hat on a cute baby just draws out the “Awww…!” factor! 2) Halloween parties or events you go to where you’re asked to wear a theme costume 3) a baby or newborn photoshoot where you’re asked to bring props (or provide them if you ARE the photographer). Here are 10 of the cutest baby costume hats you ever did see! Isn’t this little fox hat the cutest thing ever? 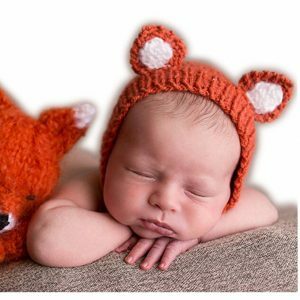 Foxes are a pretty popular theme for a baby nursery these days, so it would be fitting to have a pic of your precious little one dressed up as a fox himself or herself, no? Brand: Hobees. Suitable for 0-6 months baby. It’s a 100% handmade crochet knit costume. Price: >$15 at time of writing. CLICK TO SEE CURRENT PRICE AND DETAILS ON AMAZON! Handmade by Wowstar, sold by Amazon.com, Price >$15.00 for the set (hat and diaper cover). Is your baby’s Dad or Mom a huge soccer lover? Want to dress your sweet boy or girl in a soccer themed costume hat to “honor” that love? This is one adorable hat with the pompom touch! This one is available in 3 sizes, is handmade, soft, warm, and cozy. (Search around the Huggalugs line – there are other sports available too.) Price approx. $20 on Amazon. 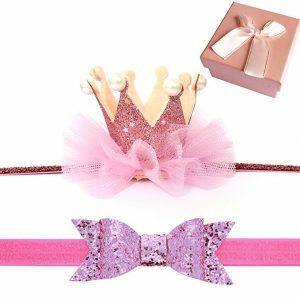 Princess Baby Accessories – Crown, Hair Bow, and Gift Box! Your baby girl is your Princess. Why not add a beautiful and comfortable crown on her head for her photo shoot? Rated 5 / 5 stars by 69 reviewers so far! At less than $15, it’s this by Elesa Miracle set makes a fantastic gift – it even comes with an adorable gift box! This Princess set is available in blue, light pink, hot pink, and gold themes, so you can select your favorite! Easter Baby Costume Hats: Adorable Bunny Ears! 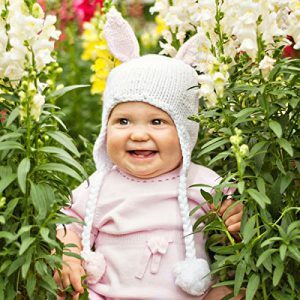 This super cute bunny hat for babies is just what you need for your little one’s Easter or Spring themed photo shoot! It’s soft, comfy for baby, styled with pink or blue ears (your choice), and comes with the adorable pompom details. Made by Huggalugs, available in various sizes. Price appox $20 through Amazon. I’m LOVING this blue and green dinosaur baby costume hat – perfect for Halloween or a photo shoot for your little one! It’s handmade, crocheted with eco-friendly soft crochet cotton. Note: you might have to do some tucking if you want it to fit your newborn – the sizing indicates it’s more for age 3-9months. Pricing: >$15, available at Amazon. There are 4 other styles by this maker (Kalevel). 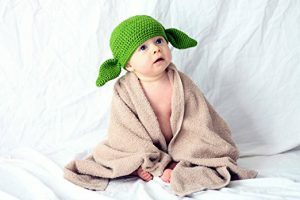 If either of your baby’s parents are big Star Wars fans (or both of you), this Yoda hat will absolutely make you smile! Isn’t it AMAZING? It’s 100% handmade, in a smoke free home, made with milk protein yarn, so it’s super soft. Available in different sizes, price >$20, fulfilled by Amazon! Mr. 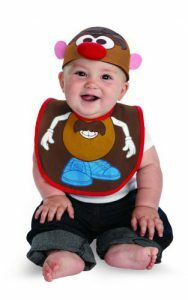 Potato Head Baby Costume Hat & Bib! It’s approx. $15, and available through Amazon! How can you not saw “AWWW! !” when you see a baby wearing a Cabbage Patch Kid wig like this one? Isn’t it seriously adorable? Funny looking, yes, but exactly what you think a Cabbage Patch Kid would look like, right? 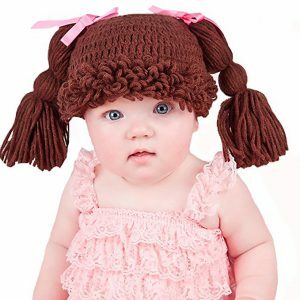 This cute and comfortable beanie style baby costume hat by Melondipity has pink ribbons, dark brown crochet yarn, and fringed bangs. It’s available in various sizes, is rated 4.7 / 5 stars by 23 reviewers so far, and is priced under $20 on Amazon. This is a super soft, very comfortable looking Santa hat that comes in all sorts of sizes from Baby/Newborn all the way up to Adult! So you and your little one(s) can all match for your Christmas photo shoot! 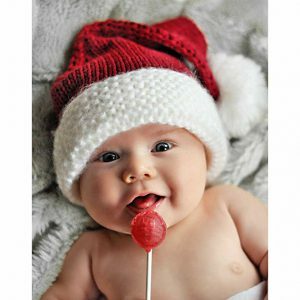 At >$15, this hat is a great choice for a Baby Santa Hat. It’s fuzzy and soft, warm, and has great reviews! Hope you enjoyed these! Baby costume hats are so much fun, and there are so many different kinds available! Which of the above is your favorite? If you have had some in the past for your own little ones, which style or costume character was your favorite? — Want to see some other fun costume hats for older kids? Check out the following posts! Dress Up Hats: Why Your Dress Up Box Needs Them! Chime in below! I’d love some feedback on these! Don’t forget to follow me on Pinterest! What Are The Best Gifts For 4 Year Old Girls? Our Top 10 Picks Under $30! I can definitely see these in cute baby pictures! I think my favorites are the Yoda hat and the bunny ears. I just saw a baby this last Sunday with a cute crocheted hat on and it was just so cute. Definitely adds character to any outfit or picture! The hair bands are always cute for little girls as well. My kids would never keep them on but I see kids all the time having no problem. Yeah, baby photographers would have a LOT of fun with these, no doubt! Don’t some of these make you wish you could crochet? 🙂 I know I sure get that wish when I see these cute baby hats – some people sure are talented!! These are very cute options for gifts for those who don’t have kids but have friends who do. I like the little owl baby costume hat and Mr. Potato. I was wondering about the durability of these products. Is the material good enough to last for years ( so it can be used for the following child)? Great question! I’m a mother of two young children, so based on my own experience, I’d have to say that you’re a-ok to assume a second child would be able to use the same baby costume hat – no problem, regardless of the material. My reason for this is that while older children (age 2-3 and up) can be hard on clothes (and toys and housewares and pretty much everything), little babies don’t have the ability to “wreck” a hat yet. They pretty much will sleep in these, wear them without fussing with them if Mom puts them on their heads while out for a walk, and that’s about it. My infant hats have gone through my children and others (some I got second hand, others I passed on to my siblings for their kids to use) and they are ALL looking pretty much good as new. Hope that helps! If you have a question about a particular hat’s quality, let me know and I’ll see if I can help you out further! I giggled checking out all the pictures. I have a 4 month old at home and I could picture him in the yoda hat. Such a wide variety of different style. There is something for everyone thats for sure.